GreveCo, makers of Trade Show Displays and Exhibits based in Orange County, California, recently designed, engineered, and manufactured this Custom Trade Show Exhibit Booth for Data Aire Inc.
Data Aire is also located in Orange County, California, and are manufactures of Server Room Air Conditioning units, (large blue unit pictured in the center of booth). 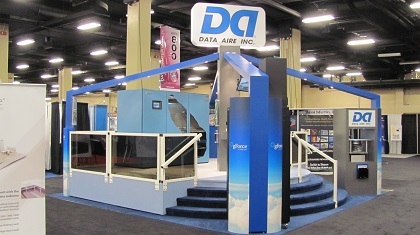 Data Aire contracted GreveCo Displays to build a custom trade show booth for the AFCOM/Data Center World Expo in Nashville, Tennessee. Custom Trade Show Display Booth Nashville Tennessee Expo Ready To Go! 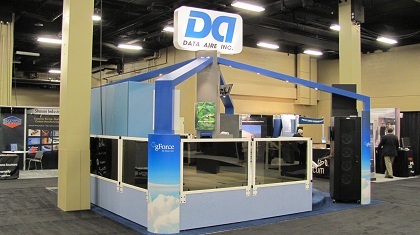 Not only did Data Aire want a trade show booth to display their product, they wanted a booth that would display their product as it would be when installed and functioning in an office building computer server room. The challenge was to install their product, the Air Conditioning unit, on a raised floor, in a custom tradeshow booth. 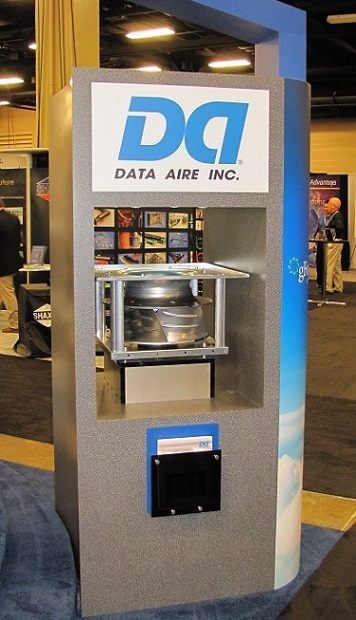 Because the air conditioner units are usually installed permanently in an office building computer server room, on a raised floor, Data Aire wanted to showcase this at the Nashville Expo. The project started with an initial call from Data Aire, they already had their 20 by 20 space booked at the Nashville Data Center World Expo but now they needed a stand to fill the space, so they contacted GreveCo Displays and Exhibits. 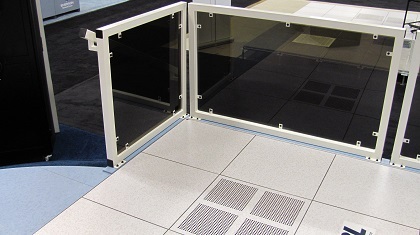 Data Aire wanted to have their server room air conditioner set on top of a raised floor in a working attitude. They also wanted signage and other Unity Cooling Units displayed as well. In addition, they wanted video presentations continuously running in strategic places within the trade show display. Another requirement was to enable good visibility of their trade show signage and art work by displaying it in several prominent positions within in the booth. Brandon Greve, the owner of GreveCo, took personal responsibility for this particular custom tradeshow booth design and initially met the client at their California premises. In the first meeting Brandon asked lots of questions in order to determine exactly what it was they had in mind and was able to do some preliminary pencil sketches right there and then. How high will the raised floor be? How heavy will the equipment be that sits on the raised floor? How many steps up are needed? Would a rotating sign look good at the top? Data Aire were pleased with the ideas that had been put to paper so Brandon went back to the office to start the actual design. A key aspect of a trade show exhibit's design is often referred to as ADA ramps. When building a booth with a raised floor it may be a preference or a requirement to include a wheelchair ramp for handicap access. When building ADA ramps though, it's important to ensure that they rise at a specific angle and height they can therefore take up a lot of the show space floor. Careful thought and communication with the show organizers is therefore important with these design considerations. Because of the size and complexity of this booth it took about 2 weeks to get the initial designs completed. Once the design renderings were finished it was time to meet with the decision makers. Brandon visited Data Aire again and provided them with all angles of the display booth. These renderings showed not only the chosen colors and artist's concept of the art work, but also showed how people attending the show will interact with the booth. This not only included the rendering and concepts but also what it would take to assemble and disassemble, a large and expansive part of the process. Brandon was also able to show various alternative raised floor designs that GreveCo had created for other clients, thus taking advantage of all the previous experience GreveCo had with this kind of purpose built trade show booth design to give Data Aire a selection of design concepts and ideas. It took about a week for GreveCo to incorporate the design changes that were decided upon in the meeting allowing a formal cost estimate. After the signed sales order was received production started and it took just a month to complete manufacturing of the trade show display complete with the signage and artwork. In this case Data Aire had their own shippers lined up as they ship the heavy data center mission-critical cooling systems all the time. 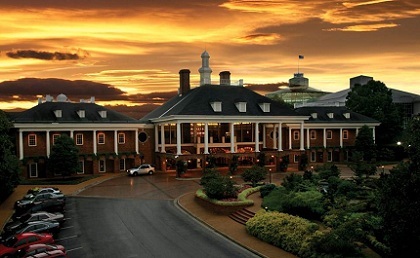 Since the product had been installed into the exhibit, it was shipped directly to the Expo in Nashville. Our clients can decide whether they want to contract the labor themselves to assemble and dismantle the booth or GreveCo can take care of the hiring of the contract labor as needed. In this case Data Aire had GreveCo take care of the process for them. On a big job like this GreveCo will typically send an experienced individual to oversee the initial setup of the booth at the show Convention Center, wherever that may be, to make sure there are no last minute problems and everything goes together as it should. This supervision is not always necessary but is a good idea on more complex trade show exhibit booths like this one. Server Room air conditioner units like this one usually sit on top of a steel base with a raised floor that surrounds the unit. The raised floor is normally surrounded by the 4 walls of the office building which usually provides the lateral stability for the raised floor thus keeping the floor from twisting and collapsing. The challenge was to have a working demonstration of the air conditioner unit, and the raised floor, in a temporary setting at a trade show, and to install the unit without renting a forklift from the show services. That would add a lot of additional expense to the project. The solution was to build a custom steel pedestal with an integral crate floor that could transport the air unit and serve as the base to build the booth around. The air unit is permanently mounted to the pedestal / crate. The pedestal has adjustable feet so the air unit can be raised or lowered on the show room floor to keep it level with the raised floor, steps, outside walls, and center rotating sign tower of the exhibit. The trade show booth's pedestal / crate is converted to a complete shipping crate with the addition of sides and a top. 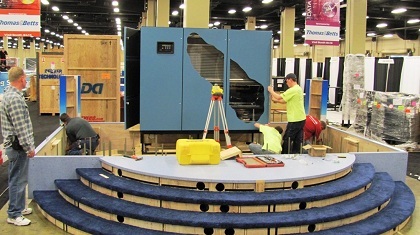 When the air unit crate arrives at the show, the crate is placed strategically on the convention center floor where it will stay for the duration of the show. The sides and top of the crate are removed. The entire booth, along with the raised floor, is built around the air conditioner unit. 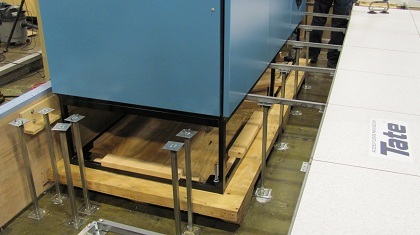 When the booth is completely assembled, the air conditioner appears to be installed, sitting on top of the raised floor. There was still one challenge to be solved, how to make the air conditioner, the raised floor and the booth all level to each other. The surround walls, the front stairs and the 4 columns in the corners all fit together without a step in the transition from the stairs and raised floor. In order to make sure they all came together smoothly, we made all of these elements of the booth adjustable by up to 3". This way, even if there was any unevenness in any convention center floor, the whole thing would be totally level. This trade show exhibit featured walls that surrounded the booth and more importantly, the raised floor. The walls of the booth locked together using what is called roto-lock fasteners. Stairs leading up to the raised floor are made in sections to fit into a shipping crate. When the stairs and landing are installed in the booth, there is no transition or any exposed unsightly threshold to trip on. Custom steel handrails were manufactured to mount to the top of the walls surrounding the raised floor. The handrails are welded, powder-coated and made from 2" square mild steel tubing. The handrails mount to the side walls of the booth using decorative socket head cap screws to give the booth that industrial look the client wanted. Smoked Acrylic inserts in the handrails provide visibility to the product from the outside of the booth. In the center of the booth is a custom built rotating sign. Unlike other booth designers, the rotating sign and the interior workings (except the rotating motor) where built entirely by GreveCo Displays. We prefer to build it ourselves simply because that way we know everything is going to fit and it will all work! The sign sits on the top of a 16 foot tall center tower, and spins at a rate of 3 rpm's, and weighs only 40 lbs. Lighting from the beams attached to the sign tower illuminates the sign as it spins. Two monitors on the center tower play in a continuous loop explaining the Data Aire products. There are also product displays on the 2 front columns, the right front corner showcases the Data Aire Unity Cooling unit, and the Data Aire Plug Fan is in the left front corner. Do you have a trade show project coming up? Whether you are in Orange County, California, or on the east coast, GreveCo Displays can provide a design to get you going along with a complete construction and assembly service. Simply call us at +1 (714) 633-5728 or complete a short Trade Show Display Stand Design request form and we will get you started.